The Two of Swords relates that you are stalemated in your affairs and you don’t know which direction to go next. You seek a new approach, but your emotions are involved which make it difficult to decide what to do. You desire to be a peacemaker, so you are reluctant to express your opinions unless you are forced to. Wanting order and stability – you seek to maintain calm through your balanced rationality, which causes you to deny your intuitions. It is the “conflict” between your opinions and others which is causing the stalemate and indecision. There is no confusion here – you have deliberately closed your eyes so that you will not have to choose between friend and enemy – the very choice which is your first step to involving yourself with people again. In your attempts to protect yourself you have closed off your heart – blocked your emotions, trying to hold them within. This attempt to stop your emotions is virtually making you more emotional. You are trying to think and act – not from your center – but from your own constricted emotions. Seek your solution through your “inner” guidance – the answers will be provided and vivid peace restored. Recognize that when you are unable to see your options – your rationality is of no help. Stop trying to “force” things to happen prematurely. Listen to the swell of your emotions – then you will KNOW when the tide has turned and it is time to act. Mental clarity and balance may require removing yourself from the action. Get away from it all to see the truth and in this state of detachment and non – involvement, you can see with non – judgmental awareness. Allow your higher consciousness to decide on an action according to the higher laws and values of the Universe. Experience your faculties of analysis – the creative power of your thought. Peace will soon be restored – you will know clarity and balance as you bring the two issues together into a state of resolution. There will be recognition and success – do not allow this situation to upset you. The entrance of the “other” at the mental level – the recognition of an alternative, then the action in relation to that choice. Decision. The desire and ability to identify and understand the other side. Arbitration, debate, defining position or opposition. Objectivity, a second opinion, review, negotiation, compromise, truce, compatibility, contracts, tact, diplomacy. To agree, to unite mentally. Next to Sun: All is not lost! You will be back in action very soon – hold on to your beliefs! Swords on all sides: Do not cut yourself off from your loved ones. Let them help you – they will understand. Remember – it is always the darkest just before the dawn! In the first position: Life’s lessons will filter through the lens of mental choice and commitment, defining choice and facilitating commitment. Personal expansion will principally involve mergers and partnerships on the Mental Plane. In the second position: Healthy agreements, liaisons, contracts. Knack for knowing your opponent. Ability to negotiate, to find the desirable compromise. In the third position: Identify and understand the other side. Mental opportunity. All is ready, decide – agreement is at hand. In the fourth position: Passion for the open forum, the consideration/;inclusion of all views, the democracy of the mind. Thirst for positive debate. In the fifth position: Dissatisfaction with the status quo; clarifying alternatives. Mental engagement – agreement with a proposal. See necessity of moving beyond present viewpoint, of the potential of integrating the ideas of an “other”. Contract negotiations/signing. In the sixth position: Impact of mental alternatives/agreement on the Emotional Plane, on relationships and your creative thrust. In the seventh position: Mental harmony of opposites takes precedence. Interest in other’s ideas. Critique for improvement purposes. Important to see and internalize the good aspects of the opposition for our purposes. A shoring up of the gaps in our ideology, in our plans, of integrating the shadow side. Refining your position. In the eighth position: Your future is unfolding through mental clarification. Mental opportunity, get ready to decide – clarify your alternatives. Contract negotiations, heart opening to other views. In the ninth position: Heart open to other views, ideologies. More so from your gut or your subconscious than your mind. Feeling, empathizing with the “other”, in some cases an adversary. In the tenth position: The other side asserts itself, alternatives become patently clear where they may have been hard to determine. A breakthrough in negotiations. Healthy compromise. Lindsey, there is no “one” meaning to the symbols you are seeing in the Rider Tarot Deck – they have thousands of meanings to thousands of different people, asking thousands of different questions. You only need pay attention to the portion of the symbols and specific divination sections which are drawing your focus and creating a spiritual/emotional/mental response within you – it is there you will find your answers. So what is the recurring mystery of the Two of Swords, also found in the 7 of swords and and stumps everyone in the biblical scriptures? Who wields the two swords and what do they represent? There’s also the recurring waning crescent of the moon (the only phase ever depicted at least in the heavens on the cards; even at the feet of the High Priestess, who resembles the 12 starred crown clothed in the sun with the moon at her feet mystery). Then the calm-ish body of water on the horizon, also found in the 5 of swords where the sky is ripped/torn. What is the biblical reference to swords and the waning crescent moon connections. 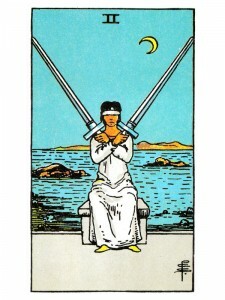 How is the blindfolds on the two and nine of swords possibly connected? The like the way you describe the cards and I find the definitions very accurate. I was a bit confused but I think I got the message.